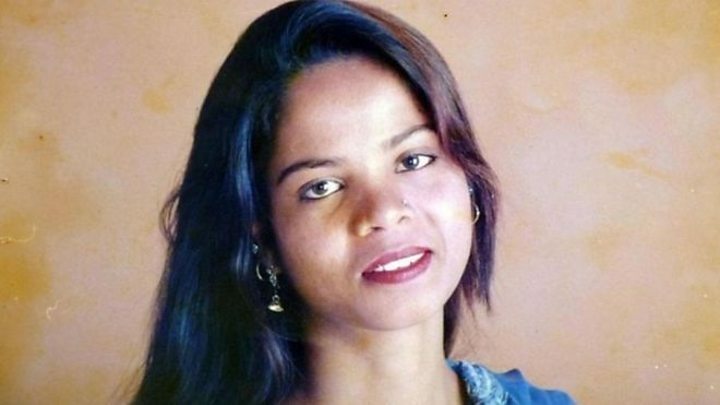 Pakistani Christian woman Asia Bibi, who was released from prison a day earlier after being acquitted of blasphemy charges, has not fled the country, the government said on Thursday. Foreign Ministry spokesperson Mohammad Faisal said that Bibi was still in Pakistan, denying rumours that she had already left after the furore caused by her release on Wednesday night from a prison in Multan, where she spent eight years on death row. Bibi, a mother-of-five, was convicted in 2010 of insulting the Prophet Muhammad during a row with neighbours. Earlier reports said that she left the prison on Wednesday night and was flown to an “unknown destination”. Faisal did not provide more details about the woman, whose acquittal on October 31 triggered widespread protests led by the hardline Islamist party Tehreek-e-Labbaik Pakistan (TLP). “There is no truth in reports of her leaving the country — it is fake news,” Faisal told Dawn NewsTV. Minister for Information and Broadcasting Fawad Chaudhry called out the “irresponsible” behaviour of certain media outlets for running the news of Bibi leaving the country without “confirmation”. The TLP wants the Supreme Court to review the verdict. The radical group last week forced the government to agree that Bibi would not be allowed to leave Pakistan and that it would not block a review petition. TLP spokesperson Ijaz Ashrafi tweeted that no government department confirmed that Bibi had gone abroad and added that government had assured the party that she would remain in the country until the verdict on the review petition was announced. Several countries have offered asylum to Bibi. On Wednesday, Italian Interior Minister Matteo Salvini announced that his country would help her leave Pakistan. Last weekend, Bibi’s lawyer Saif Mulook left Pakistan, citing threats to his life after protests against the acquittal paralyzed the country. Pakistan’s harsh anti-blasphemy law was established during British colonial rule to avoid religious clashes. But several changes to the law in the 1980s promoted by the then military dictator, General Zia-ul-Haq, led to its abuse.